So what would happen if we evacuated Texas for a century? Be interesting to see what effect that would have on current warming. >THE Ben Reilly< wrote: So what would happen if we evacuated Texas for a century? Be interesting to see what effect that would have on current warming. I think this further proves and shows further. What dramatic effect humans have on the balance of nature and climate. Interesting thought provoking question you raise. Which I would go one further on. How about if there were no longer any humans around? Would the planet become balanced again? I think it probably would, if there was no more carbon being put into the atmosphere. You'd also have to factor in vegetation taking over huge areas currently covered by sprawling cities. If we could go zero-carbon tomorrow, I do think we'd be fine. The real problem is going to be how long it takes to get to that point, and that's why I get so angry with climate deniers. I don't know if they've ever considered this, but I see them as making my stepkids' future harder than it has to be, and that really gets me into protective-parent mode. The point to me, is more about human population and the natural resources we end up continually using. Let alone the factors played on this through Urbinization. We simple have out gorwn this planet with needs. As again many people simple do not spare many thoughts on this.. So how does a field of corn or whatever, absorb less CO2 than a field of grass? Maddog wrote: So how does a field of corn or whatever, absorb less CO2 than a field of grass? Is Corn one of them? Is animal husbandry one of them? The question you should be asking is based on the balance of corn fields, comapred to the effects globally with urbinization and other forms of animal husbandry and many forms of farming. Urbanization was not mentioned in this study. I'm not talking about what's happening today. 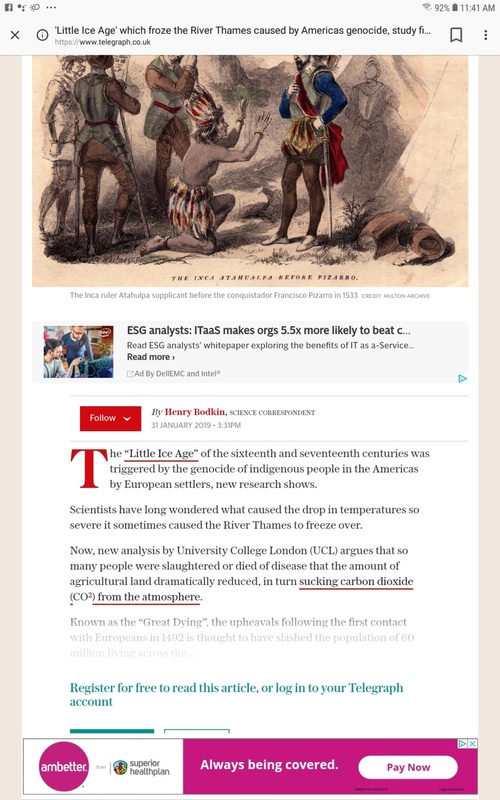 I doubt there was any measurable impact on CO2 levels by land use changes brought on by the death of all of those Indians. The land was still covered in some form of vegetation. Then you are not factoring everying are you mate? Its not a winning argument on agriculture stopping climate change really is it? So... what caused the Thames to freeze in February 1814...!? Tommy Monk wrote: So... what caused the Thames to freeze in February 1814...!? But all crops are vegetation, using roughly the same amount of CO2 as non crops that are also vegetation. If the Mayans ran steel mills, and then they died off, I can see that changing the climate. Changing the kind of vegetation doesn't seem like it would have any kind of impact. But I can't read the article, so maybe they explain it. Soory but on what level does that equalize the level of CO2 that we are producing through industries and urbinization? The Mayans, actually like many civilizations came into ruin. It would not have mattered if they had had steel mills. What matters is the effect a population has on the environment. Of which the Mayans and Olmecs are a classic example of over popultion, based on the nature balance. The thought provoking questions is based on humans being the problem constantly here. Not suggesting any kind of ethnic cleasning or genocide. Yet we see again humans that caused genocide, ended up inadvertantly stemming the tide of climate change. For a short time. Hence should that not mean, again humans are the problem to the planet? Eiether we learn to respect the plant and stop abusing it or we look to expand elsewhere. That we do not harm their environments. What does urbanization have to do with the Little Ice Age? If anything, waffles would have warmed the Thames and helped to melt it. If you think I am wrong? How many species are now close to extinction based off our human activities? But it was humans that created the agriculture that was destroyed by the death of those humans according to this theory. They are claiming the lack of human activity, brought on by a lack of humans caused the Little Ice Age. I'm not buying it. There were no large scale farms back then. A cultivated field had the same impact on CO2 levels as a non cultivated field. Now this makes a hell of a lot more sense. Volcanic activity has altered the climate throughout the history of this planet. Trees absorb more CO2 than those crops will; (and don't forget that crops are only there for a few months -- being rotated through with fallow and pasture periods..). And also don't forget that it takes decades for many of those trees to mature; and it will take 150+ years for forests to be regarded as "old growth", with lots of added biomass and diversification to aid in carbon 'capture' and storage.. In those first few decades, rotting and burning corpses and crops would have been adding excessive amounts of CO2 and methane to the ashes, while the trees were still growing sufficiently to re-absorb them again..
Volcanoes have been there from the beginning -- as part of the background environmental activity, they are already 'factored in' to developing and evolving the world as we know it today.. IF there had been significant increases in volcanic activity over the last 400 years (or "solar flare" activity either, for that matter -- another bogey beloved by mining company propagandists..), then you might have a case. There simply hasn't been a significant enough change either way though -- thereby making ypur hypothesis meaningless.. It's not my hypothesis comrade. You never read all the opening link, did you mate? 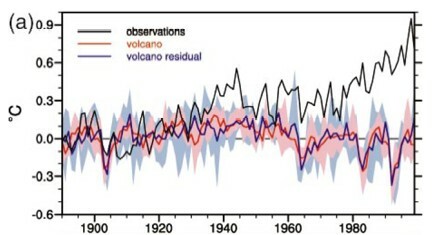 Ed Hawkins, professor of climate science at Reading University, said: "Scientists understand that the so-called Little Ice Age was caused by several factors - a drop in atmospheric carbon dioxide levels, a series of large volcanic eruptions, changes in land use and a temporary decline in solar activity. "This new study demonstrates that the drop in CO² is itself partly due the settlement of the Americas and resulting collapse of the indigenous population, allowing regrowth of natural vegetation. “It demonstrates that human activities affected the climate well before the industrial revolution began." And then stating that it "makes ..more sense" to you.. Interesting. So you are willing to put faith in the fact the earth in part on the surface was once frozen, but not basically a hot furnace on the survice and in the future to come? One wonders at what else you believe in based on facts, when its the same science that states humans are causing these changes. Is the same science tha shows the earth also had ice ages. Dude. I'm talking about what caused the Little Ice Age. I dont believe it was caused be a change in vegetation due to the death of millions of people. You started a thread about the cause of the Little Ice Age and seem hell bent on making it about contemporary events. None, because the people living there would just live somewhere else on the planet. Unless they are all evacuated to Mars. So you deny aspects that helped cause this but happy to buy some apsects. Not making about conetmporary events, as what pendamic has happened? Why do you find that so hard to believe based on scientific rationaliztion? Google little ice age. The general consensus is that it was caused by volcanic eruptions. No doubt there are other theories. I get to have my opinions too. I dont believe a change in vegetation type changed the climate. You say it's clear that it did. Can we stop global warming not growing wheat in Kansas and letting all of those fields return to prairie grasses? Science is an ever changing aspect of looking at the earths past, so again I ask the question. Why do you find that so hard to believe this new theory based on scientific rationaliztion? Do you actually have something scientific? Do you even read your own links mate? The little ice age started in 1315. What year did Columbus sail the ocean blue? 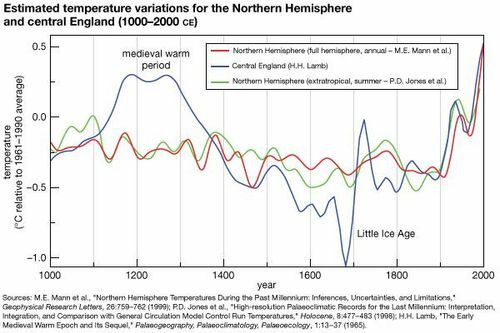 Maddog wrote: The little ice age started in 1315. So what does it matter when Columbus set sail, even more so when Vikings discovered America? Because I dont think a change in vegetation would have enough affect to change the climate. Volcanic eruptions have a long history of doing so. Because your link indicated that the cause was the settlement of the new world when Columbus arrived. I know the change happened. It's well documented. It didnt happen because the Aztecs grew less corn. Volcanic eruptions caused it. It never claimed to be the only cause. So again, why is this so hard for you to believe, based on the evidence presented? These periods of diminished solar activity were likely significant contributors to the LIAcooling. 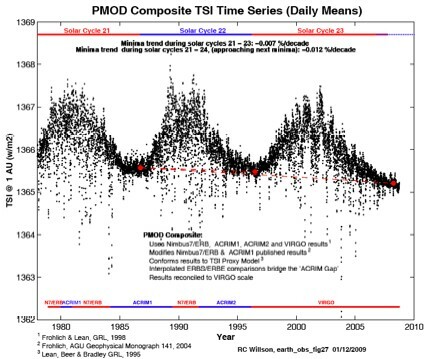 And solar activity has increased since the end of the Dalton Minimum to the current 'Modern Maximum'. 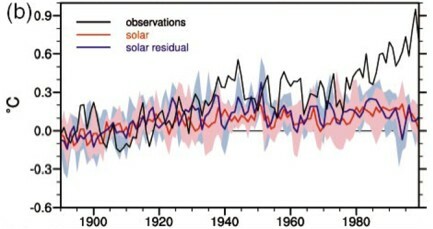 However, solar activity has not increased on average since the mid-20th century. However, since the Greenland Ice Sheet has been declining due to the global warming over the past century, and the slowdown and potential shutdown of the thermohaline circulationhas become a concern as a result, quite obviously the ocean conveyor has not had a warming effect over the past century. "If the 10-ppm CO2 decreases are caused by plague-induced reforestationevents, they would cool northern hemisphere temperatures by ∼0.17°C, assuming a 2 × CO2 sensitivity of 2.5°C." Of course, we've seen the exact opposite effect in recent centuries, as the human population has continued to grow, increasing deforestation, and of course anthropogenicCO2 emissions through burning fossil fuels. However, it's difficult to classify increased human greenhouse gas emissions as a "recovery from the LIA." And other theories suggest volcanos. My theory is that the black death was in part a result of the little ice age, not a cause of it.